Though metal workers have several processes to choose from, this particular method of production allows for the creation of near net shape products with great detail that would otherwise be difficult or impossible to achieve with other casting methods and secondary processes such as welding and soldering. Investment casting is among the most basic techniques used and as such delivers reliable results at a reasonable cost, though it is not always the most economic of options. In short, this multi-step process involves forming a mold around a wax pattern and allowing it to harden before melting away the wax, leaving a hardened shell that can be filled with molten metal and removed once the desired form is sufficiently cooled. The process is extremely versatile and with proper knowledge of the chemical formulas and molecular composition of the materials involved, manufacturers can instill specific attributes such as durability, magnetism, or weight load while diminishing or eliminating negative characteristics. Proper mechanics also allow for castings to be as small as fractions of an inch thick or as much as 1,000 pounds in weight, though most investment casting products are 15 pounds or less. Such capabilities find investment castings in the aerospace, automotive, chemical, defense, food processing, electrical, railroad, mechanical, marine, electronic, textile, engineering and several other major industries. Though relatively straightforward, the investment casting process involves a number of detailed steps. 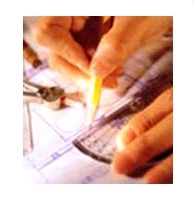 To begin, manufacturers must create a master die or wax pattern. Though not always made of wax, this feature gives the process its alternate names of wax casting and lost wax casting. This form is an exact replica of the part to be produced. In some cases, it is the original prototype which may be either hand carved or carved by machine. It may also be made through injection molding. It is crucial that any flaws or imperfections be removed at this time and that exact specifications are met. 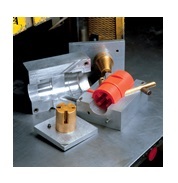 The master die is then mounted on a wax rod known as a sprue using a heated metal tool. Several such patterns may be attached to one sprue forming a cluster known as a tree. The next step is to apply what is known as the investment. This ceramic slurry must coat the entirety of the wax mold. Common techniques include dipping the sprue or tree repeatedly into the investments of decreasing fineness until the desired thickness is achieved or alternately affixing the sprue in a flask and pouring the investment in around it. Once the investment dries and hardens, it is placed upside-down in an oven or furnace, causing the wax form to melt and run out leaving the desired mold. Additional heating ensures that all residue and moisture are gone and preheats the mold allowing the incoming molten metal to coat more evenly before cooling in the mold. Once the metal is poured into the mold it is cooled and the hardened investment shell is removed via media blasting vibrations, hammers, or a dissolving agent to reveal the seamless final product. Investment Casting Process The investment casting process is a popular metallurgical technique used to create detailed industrial parts and components through the metallic replication of wax models.